Save 10% on all three by buying a Tub, a Tube, and a Super-cheap Brush together. Select the Viscosity for the Tub and the Tube from the menus below. Carry Guns: Applied extremely sparingly for maximum reliability. 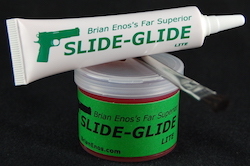 If you only will buy one viscosity, Slide-Glide Lite is perfect for all firearms above 30 degrees F.
Slide-Glide Standard was originally blended for “factory” pistols in temperatures above 60 degrees. Its viscosity is a little too thick for compensated pistols, .22’s, and revolvers. Just a note to let you know that 14 years on with my issue P-229R with a round count of around 15k rounds and the same barrel, using Slide Glide Standard #1 and nary a hiccup. But for external wear the inside of the top end is still factory fresh. Compared to other agents’ pistols it’s amazing seeing the difference. Now that at some point in the near future when I change duty stations I will have our new issue Glocks (19M and 26) foisted upon me. They will receive the same treatment. I appreciate the temperature ranges you’ve published but I found that in Central Asia and the Caucasus during winters down in the single digits Fahrenheit my body heat kept the standard viscosity loose enough to let the gun run fine. Might have been sluggish if carried in a drop rig but I’ve never had an issue with the standard viscosity in any temperature. Thanks again, Brian, for such an amazing product. I have been using Slide Glide for years on my firearms, but since I have moved to the Mississippi Gulf Coast I have developed an addiction to fishing. I have tried many different “marine” lubes on my various reels, but the saltwater just seems to chew them up and spit them out. With the “marine” lubes, I have to relube after each outing; it was getting old. It worked like a champ, the slide glide stayed where I put it and I was able to cast the reel like it was new. So far it has stood up well to the saltwater but only time will tell. 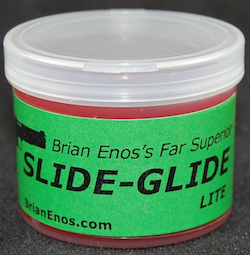 In my opinion your Slide Glide is the best all-purpose lubricant on the market. Fishing is a natural extension of your market, still appeals to the same outdoors crowd but also appeal to the non-shooter fisherman. Bottom line, Slide glide will protect the heck out of fishing reels. I wanted to commend you on your Slide Glide product. I have a Kahr T-40 pistol that would not fire to full magazines without failing to go into battery. I would have to hit the back of the slide with the heel of my hand to fully chamber the round. For this reason I would not rely on the T-40 as my primary side arm. After cleaning my pistol and applying slide glide to all the contact services, I went to my local range and fired 100 rounds without a single hiccup. Kahr should include a couple of tubes of Slide Glide with all their stainless steel handguns. It is obvious conventional gun oil does not provide enough lubrication to prevent friction between stainless steel mating surfaces. Keep up the good work and I will tell anyone who owns a Kahr stainless steel pistol to invest in Slide Glide for 100% functionality every time they squeeze the trigger. Slide-Glide Gun Lube, Lite,Tub, 2 oz.